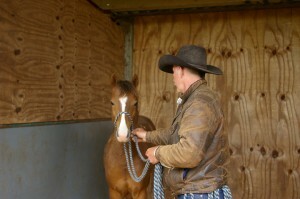 Introduce a horse or pony to his first halter and lead rope in a stress free safe way. A chance to start building a strong foundation with young, nervous and remedial horses in a safe environment. How far each horse progresses during the courses depends on the horse, which is part of our ethos to take the time it takes and not rush the horse. You are welcome to bring you own youngster, weanling or remedial horse to help him progress at no extra cost. This course will show you all the important skills to help the horse learn in a safe and relaxed environment.